One of the questions the Alpha Rail technical team has been asked is whether there is a legal precedent for the distance between signal posts and pedestrian guardrail when installed on a public highway. Our Technical Sales Manager, Roger Bristol, has given us the insight of his 30+ year career to provide the answer. 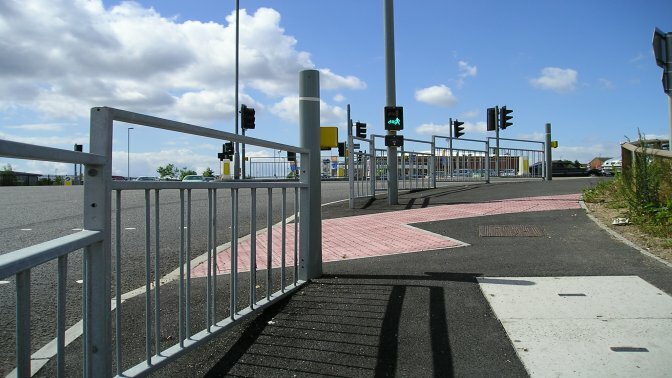 Strictly speaking, according to BS 7818, which is the British Standard applied to metal pedestrian guardrail, there should be a minimum 450mm gap from the guardrail to the face of the road, which is usually the edge of a kerb. That said, on faster roads, this distance is usually extended to 650mm. This is because these distances are adjudged to be far enough out of the way of passing vehicles, but also narrow enough to act as a deterrent to prevent pedestrians from being tempted to walk on the traffic side instead of pavement side. However, should they accidentally find themselves stepping along the ‘road’ side of pedestrian guardrail, there is a small enough area for them to stand back should a passing vehicle approach. When considering the installation of upright traffic signal posts and their proximity to the pedestrian guardrail panel, the rule of thumb is that the pedestrian guardrail runs half way down the drop kerb and does not pass the upright traffic control post to prevent those with poor eyesight from bumping into the end of the guardrail. Though some installers do prefer to end the pedestrian guardrail at the bottom of the drop kerb to be extra safe. The distance in width between the post and the PGR panel, should be such that people are prevented from passing between the post and the guardrail, but without the traffic post signage overhanging into the road where perhaps the wing mirrors of vehicles will bang into them. If you would like further help or advice please fill out a contact form or call our technical sales team on 01623 750214. Please also visit our technical drawing section.